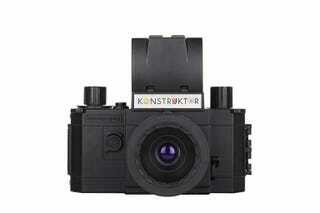 Lomography has started selling a fixed aperature $35 plastic 35 mm SLR that you assemble yourself. I'm a toy camera aficionado, so I had to get one; I have a Gakken TLR kit camera that I absolutely adore, and I thought this would be similar. So it is. It took my photo partner and I about 90 minutes to get the whole thing assembled. There are a few errors in the instruction drawings, but they're easy to find and figure out. It comes with a 50mm f/10 lens, which is detachable. I believe Lomo is intending to make more lenses for this in the future, but right now, this is the only one. It has all the things I love about plastic lenses; distortion around the edges of the frame, and it's generally soft. Focusing is done through a reflex finder. It too is plastic, and so can be a little hard to see, especially in low light, but it works. In order to see anything at all, you do need to flip the (plastic) mirror out of the way by using a little lever; it will snap back after you press the shutter. Both the shutter and the mirror lever are in slightly weird spots, and you need to reposition your hands in order to accomodate them. For $35, it'a a lot of fun. You're never going to get super sharp pictures, but if you like vignetting, unexpected light flares, and all the quirks of a plastic lens, this little camera won't disappoint.